Interplanting existing prune orchards where established trees don’t fill their space is a long accepted practice to increase grower income while limiting costs compared to complete orchard removal and replanting. This is often done in older orchards either by interplanting down the existing tree row or changing the direction of the tree rows 45o and interplanting on the diagonal between two existing trees. Research by Dr. Themis Michailides since 2016 has shown pruning wounds on young trees are especially vulnerable to infection by Cytospora, Botryosphaeria, and/or Lasiodiplodia fungi. These infections damage developing scaffolds, potentially limiting orchard productivity over time. Pruning wound infections on 5th leaf interplanted prune tree. Growers should reconsider interplanting prunes – or at least how they treat interplanted trees — due to the risk of pruning wound infections. The primary source of the infections in interplanted trees are the mature trees in the orchard — often in decline themselves due to those same canker and wood rot diseases. Pruning wound infections can be minimized by 1) pruning in late summer or spring with no rain in the forecast or 2) pruning during winter and spraying Topsin-M® or Topsin-M® + Rally® after pruning and before the next rain to protect the cuts from infection. Dr. Michailides reports that Topsin-M® is especially effective against Botryosphaeria. Adding Rally® could be helpful for resistance management. With yield and net income limited by tree spacing that is too wide and/or tree health in some older blocks, growers must choose between interplanting and removal/replanting. 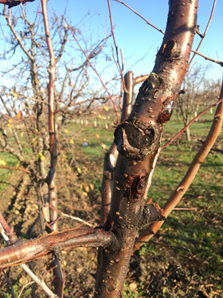 While interplanting costs less up front, pruning wound infections can speed the rate of tree decline in interplanted orchards reducing grower returns.